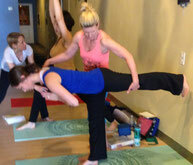 We offer a variety of yoga classes both on the ground and in the air. Check out the many different teachers at Yoga On York to experience the many different flavors of Yoga. Skill building with some prior yoga experience helpful. This class is best suited for those who are familiar with basic yoga asanas, and are looking to advance to the next level. Each teacher at YOY is unique and different, bringing his/her own teaching style to yoga. Taking traditional yoga postures on the ground and adapting them to the air using fabric hammocks that are hung hip level. Some upper body strength is required for our mixed level aerial yoga classes offered on Wednesday evenings 7:30pm or Saturday mornings at 9:30am. If you are a beginner, we suggest that you try Gentle Aerial Yoga offered Tuesdays at 6pm. Please wear shirts that cover your underarms. No jewelry, watches, zippers, velcro or anything that can snag the fabric. No perfume, lotions, oil in hair. For just $7 our popular community yoga classes combine detailed quality instruction with a blend of basic and intermediate postures. Some experience with yoga is suggested, but not necessary. A great way to practice yoga for those on a tight budget. For people who need to slow down the pace. Calm and peaceful stretching and strengthening with breath work and meditation integrated. This class is for anyone and everyone (ages 10 - 90) who has wanted to try Yoga but is too intimidated to step into a studio. Breath work (pranayama) is the main focus to build a strong foundation for transformation. Finally, a class for all those Guys with hamstrings of steel. This class uses basic yoga poses to improve flexibility, core strengthening, and relaxation to help in all aspects of everyday life. For men only! This is an opportunity for kids to explore their own yoga practice. Students will begin to answer the question "What is Yoga?" as they learn the basics of postures and breath. This class is appropriate for children who are new to yoga, as well as for those who are continuing their practice.